First things first; you may have noticed that I am writing a review of a fellow Photoshop Nut’s book, the more eagle-eyed of you will also have noticed that the book is advertised on this site. What follows is an independent review and has not been affected by any of these factors. Quite a lot. 320 pages in the physical form (my copy is an electronic one, easier to stand up by the side of the computer while doing the lessons) with a DVD of lesson files, training videos, interactive quizzes and bonus exercises. Plenty of bang for your £39.99 (can be found for less on Amazon etc.) if you fancy the paper version, the Kindle version is £25.99 and and iBooks version is available at £29.99. 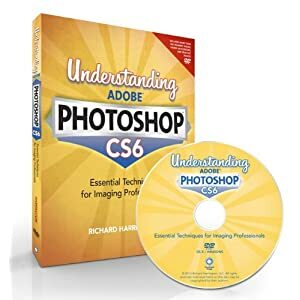 There are 16 chapters going through many of the most important techniques in Photoshop, starting with importing images to printing out your finished masterpieces. Each chapter is clearly set out and takes you through the basics through to more advanced techniques. Throughout the chapters there are prompts to view video lessons which are excellent additions to the written instructions and the end of chapter quizzes are a great way of seeing how much of the information has stuck inside those little grey cells. Mainly cosmetic and down to the publisher and not the author. The cover doesn’t do justice to the content; for a book about photo manipulation it doesn’t show any on the cover many of the competing title on the subject will. Bonus chapters, couldn’t they have been added to the number of “normal” chapters? The usual niggles with ebooks, layout etc. Yes it is. For a book that sets out to aid learners it offers clear, concise text and visual explanation to get you up and running in no time at all. This may not be the book for the advanced user but there is the odd nugget you may find useful and taking some of the quizzes may be a little denting to the ego! I would wholeheartedly recommend this book to any “newbie” to Photoshop as a great resource and introduction.